Talk about quid pro quo. 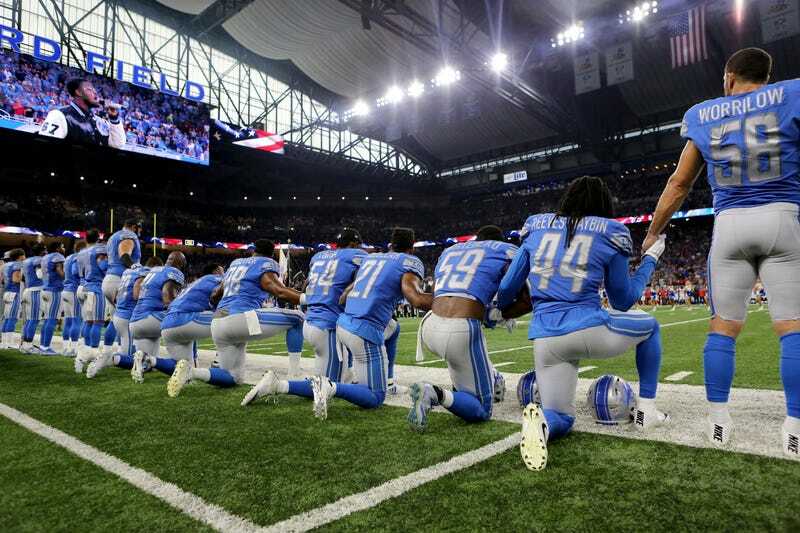 Although Detroit Lions owner Martha Ford linked arms with her players during the playing of the national anthem last week (after President Donald Trump disparaged the players days earlier by saying that they should be “fired” if they kneel during the song), Ford, a 92-year-old billionaire, asked her team not to kneel during “The Star-Spangled Banner” in a team meeting last week, the Detroit Free Press reports. In exchange for not kneeling, according to the Free Press, Ford said that she would donate money to community issues and organizations close to the players’ hearts. “She just asked us not to take the knee and basically told us—not basically, she told us—she would back and support financially as well as put her name on whatever issues that we wanted to try to attack,” Lions defensive end Cornelius Washington said. Of those eight, only two knelt before the game against Minnesota on Sunday, while the rest of the team linked arms on the sideline. Defensive tackle Akeem Spence, who said that his father lost a contract job over his son’s decision to take a knee last week, was among the players who stood Sunday. The Freep reports that Abdullah and Washington said players have not yet decided how they want to distribute whatever resources Ford makes available. So does this mean that no Detroit players will kneel against racial injustice for 30 pieces of silver donations to charitable organizations? Seriously, is this pragmatism or being bought off?